Interesting news from the Texas Craft Brewers Guild today: a study published on the state of craft brewing in Texas, and where it could be in a few years. Where it could be, that is, if legislative reforms can be passed in the coming years to allow Texas craft brewers to sell packaged goods directly to the public in their tasting rooms, and to allow brewpubs to sell draft and packaged beer off premises. According to the study, craft beer is a fast-growing industry in Texas. It could grow even faster than currently projected if small craft breweries and brewpubs weren't shackled by antiquated – we're talking the era of Prohibition repeal here – regulations positing a strictly enforced three-tier distribution system. This system favors industrial lager manufacturers and bigger out-of-state craft breweries with bigger distribution contracts, and makes it harder for smaller local brewing outfits to break in. They just don't have the market power to woo these independent distributors, who aren't in the business of gambling on new and untested products. Those of us who live in the state and who follow the local beer scene are familiar with the difficulties faced by Texas breweries because of the current system and how incredibly unfair it is, especially since Texas wineries are allowed to sell directly to the public and build brand awareness, unlike breweries (and yes, their product contains on average twice as much alcohol by volume). Texas beer nerds are also aware of the ongoing struggle to advocate for more modern legislation through efforts such as last year's doomed-by-committee bills HB 602 and HB 660. Some Texas craft breweries and even distributors have joined the fight via lawsuits. But nothing has worked. Will a study by an (admittedly biased) interested association on the economic potential of this growing industry be the thing that makes the Texas state legislature realize they're missing out on a golden opportunity in taxes here? Perhaps, though I won't hold my breath. But I'm of the opinion that any amount of publicity about this issue is good, and optimism never hurt anyone. There's always the 2013 Texas legislative session. Someday we'll get there, and we'll look back on this era with sadness and embarrassment at how foolish we were, how blindly we let the interests of big business win out over those of Texas business owners and Texas customers. But until the sunrise on that bright, shining beacon of a day, we'll just wait. And hope. Sorry, Internet, I've been holding out on you. Weiss Blau Weiss Bavarian Hefeweizen, my experiment in simplicity that I brewed in June, has been pouring for over a week now, and I've had several pints of it already; but I haven't yet written about it. It's high time I did, so you can enjoy it vicariously as much as I've been enjoying it … well … the regular way. It pours beautifully: a creamy golden color with a gleaming white head. It's cloudy, as a hefeweizen should be, and except for a little bit of floating sediment, it looks as good as any commercially brewed hefeweizen I've ever had. 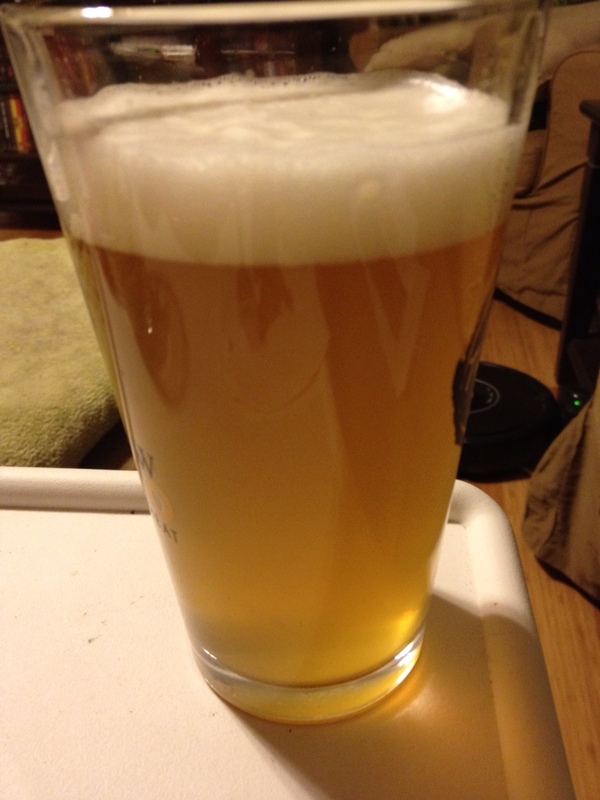 The sediment should clear up once I pour a few more pints off the keg. 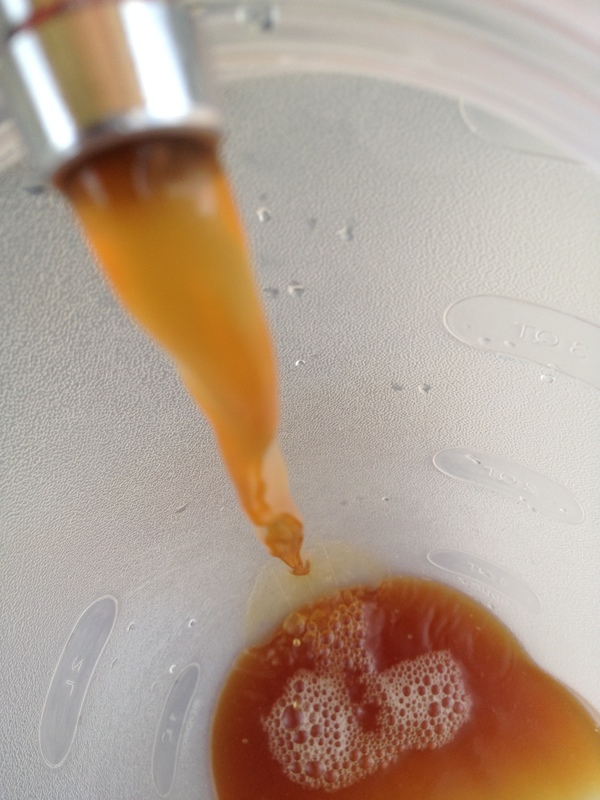 I did use Irish moss for this brew – as I do for most of my brews – but there are many who choose not to use kettle finings for hefeweizens, and it's possible this worked against me in that it precipitated more particles out to the bottom of the keg. But I'm sure it'll be fine in a few more pours. The aroma is spectacular. Exactly what I wanted: lots of banana esters, a touch of the sweet, grainy aroma of crisp continental Pilsner malt, and the faintest whiff of clove spiciness. That's about it. No hops on the nose at all. Nothing confusing or muddling. You can tell instantly what ingredient created every single component of the olfactory signature of this beer. The taste is good, too. It's light, of course, and perfect patio refreshment for my next summer brew session. The yeasty character doesn't lead in the flavor department the way I was hoping it would, not like it leads the aroma. I don't usually bother with that little slice of citrus that most brewheads outside of Bavaria are so fond of in their weizens, but I could see a lemon wedge adding something to this beer, just because it could use a bit more zing (sadly, I don't have any in the house). I don't blame the recipe for this little flaw, rather my fermentation temperature. Next time I make it, I'll ferment a couple of degrees higher for the first couple of days. The mouthfeel is just right for a summer afternoon: refreshing, not too astringent. It goes down smooth and easy, and at 5.2% ABV is pretty session friendly. So there you have it. Weiss Blau Weiss Bavarian Hefeweizen was an overall success, not despite its simple recipe but because of it. In fact, it seems to me that my efforts to introduce unnecessary complexity to the process – namely, using kettle finings and overchilling during fermentation – was the main thing that kept it from being (to me) a perfect beer. But that's okay; it's still plenty drinkable, and I'm sure I'll be emptying this keg pretty quickly … no complaints here, because I'd love to make it again. Can I make it even simpler next time? Probably not much so, but the lesson has been hammered home: one doesn't need a mile-long list of ingredients to make a damn good beer. Of course, the Bavarians have been trying to tell us that for centuries. As Central Texas is plagued by thunderstorms, I'm stuck in the house enjoying the last of a bottle of Mikkeller It's Alive! Belgian Wild Ale. 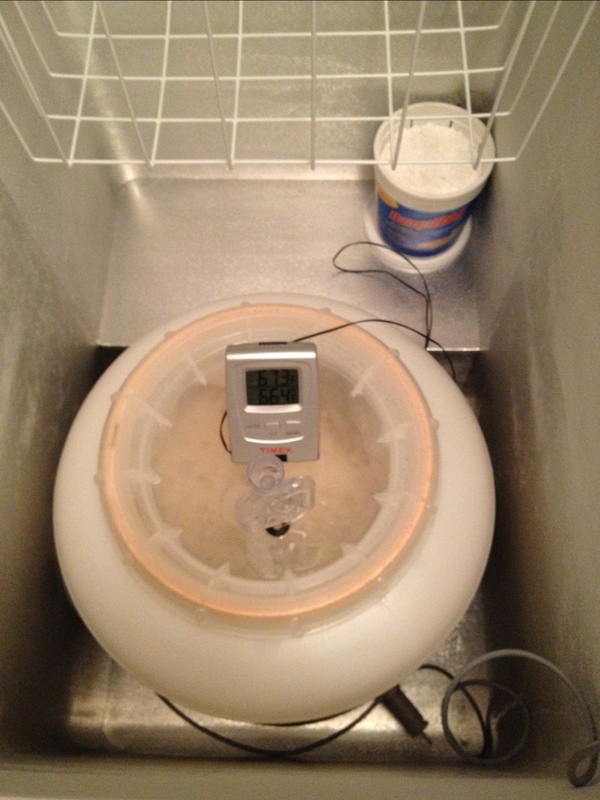 And I'm raising my glass virtually to Dustin Sullivan, a fellow member of the online homebrewing forum HomeBrewTalk.com, and the creator of this awesome pictorial on how to make a yeast starter. I love brewing. I love comic art. And I love anything that's educational in a novel and interesting way. This pictorial is all three, and I'm thrilled to have stumbled onto it. I wish everything in brewing could have been explained to me so simply when I was starting out. Sure, learning as you go is 50% of the fun of brewing (another 25% is drinking the results, and the last 25% is being able to impress your friends by dropping words like “saccharification” and “attenuate” into everyday conversation) … but I'm a knowledge addict, and I'm also pathologically risk averse. So I read everything I could get my hands on when I was starting my homebrew habit, so I'd have a good idea of each step of every process before I jumped in. Sometimes, it was hard to separate the good info from the bad: to separate the clear and “just-enough” from the over-explanatory, and to separate the simple sharing of helpful information from the vomiting of brewlore all over you by guys who just want to impress you with how much they know. Now, I love John Palmer's How to Brew and Charlie Papazian's The Complete Joy of Homebrewing. They're phenomenal books, and essential for anyone entering the hobby. But if I'd had something as simple and clear as Dustin's yeast starter pictorial for my first extract brew, my first mash, my first rack to secondary, let alone my first yeast starter, I'd have lost a lot less sleep as a newbie. Dustin also created a yeast calculator website called YeastCalc at yeastcalc.com. It's one of the most comprehensive pitching rate calculators I've seen online for liquid yeast. It tells you not only how big of a starter to make, but also allows you to dial in a target specific gravity for your starter, and tells you how much dry malt extract to use for that target. It even has options for calculating multiple step-up starters, for that 10-gallon barleywine you've been wanting to make. I'll be using this site next time I make a starter, and I recommend you do the same. So I’d like to raise my beer glass to Dustin Sullivan, another homebrewer out there doing his part to make brewing a little easier and simpler for the rest of us: newbies and veterans alike. Thanks, Dustin. Prosit! Also, anyone out there who isn't yet a member of HomeBrewTalk.com, check it out. There's heaps of information there. If you have questions, it's a great place to turn; if you have answers, we always welcome new insights. And it's the most helpful, responsive and engaged online community I've ever been a part of. If you join, look me up. My username is shawnbou and I'd love to hear from you. The wort looked and smelled delicious coming out of the mash tun, a sort of tangerine-copper color with an aroma like toasted artisan bread. I’ve got high hopes. All of my Galena hop pellets were rated 12.8% AA. I’ll probably add another half ounce of dry hops before kegging for added aroma. My OG came in at 1.055, pretty much smack in the middle of the BJCP range for American Pale Ales. I pitched 15 grams of rehydrated Safale US-05 yeast. But my real declaration of independence this brew session was from my old swamp cooler. After long deliberation (and somehow, writing about the idea a couple of weeks ago made it seem more feasible – thanks, Internet!) I finally bit the bullet and got myself a true temperature-controlled fermentation chamber: a Kenmore 5.1 cubic foot chest freezer with a Johnson Digital Temperature Controller dialed in to a range of 65-68°F. The Galena APA has been in there for a few days, and I’m still working out the kinks. Last night after I was out of the house all day, it had somehow got down to 60°F, though it was back up within minutes after I cracked the freezer lid for a while. But I can already say that this is one of the best purchases I have made in support of my homebrew habit. Ever. No more checking the closet every hour to monitor the temperature. No more keeping dozens of frozen water bottles on hand, waiting to be used in the swamp cooler, spending their idle time rolling around my garage freezer and making it harder to find more important stuff (like, you know, food). Perhaps most importantly, no more risks of infection from the stagnant water in the swamp cooler, which always bothered me. I just let it do its thing, check it once or twice a day, and it’s always been in the range I want … except for last night, but it’s never gotten higher than 68°F. And now I am at liberty to brew what I want to brew, any time of year. I can lager in August. With a few modifications, I can make warm-fermented fruity Belgians in February. Freedom. I dig it. Don’t we all?